Washi Tape is one of the greatest crafting inventions since scissors! At least that is my humble opinion!! Now, if you aren't familiar with Washi Tape…let me give you a little lesson. Washi is a style of Japanese paper tape. The whole thing started back in 2006 and has spread around the world like wildfire! Originally the tape was all made in Japan, but it is now manufactured all over the world. The great thing about Washi Tape is that it is so versatile! The adhesive is sticky, but not too sticky and can be repositioned and even reused. It is easy to tear and you can even write on it. If you want to read an in-depth article about all things Washi…go HERE. Here are some pictures of some adorable Washi Tapes you can get at Joann Stores. There is no end to the cute designs and colors of the tape! So, as I started collecting this wonderful creation….I started thinking that I needed a great way to store it! I started looking for a great Washi Tape Organizer. I looked and looked and saw lots of great ideas, but nothing that really seemed to fit what I had in mind! I finally saw something interesting over at Kendra's blog, Simply Darrling. She started using a mug rack for her Washi storage. It got me thinking….I really liked the idea, but knowing how much Washi Tape I planned to eventually own…I knew it would be too small! This is a nice big Washi Tape Organizer and someday it will be completely full of hundreds of rolls of Washi Tape! 🙂 (yes…I have some addiction problems when it comes to craft supplies) The great thing about this holder is that I can always repaint it if I want to change it up…I could even go crazy and put Washi Tape on it!! I am curious…do you use Washi Tape? If so, do you have any kind of Washi Tape Organizer? That sounds like a very clever way to store it also! Yea for Washi Tape!! I love this tape, you can really get creative with it. I recently purchased a gold sparkly one for a recognition board at work. It looked fab! That is great! It is funny that even people who don’t do crafts find ways to use it! Great idea! Also, that gold chevron tape is awesome!! I love Washi Tape but an not a crafter…yet 😉 Who knows what may happen in the near future. I am also a fan of the Chevron patterns. This is something that my daughter needs.. thanks i am going to share it with her. I love wash tape! It’s so fun to hang pictures with and add a little color! MUST go out and get me some washi tape. I’m starting to see Washi tape a lot more… I wish I knew about it sooner! I could have used this for so many projects! What a cute idea! I wish I had that much washi tape to organize. I own my fair share of wash tape and keep it all in a large jar. It’s retry to look at but definitely a pain when I want to use the one on the bottom. Your idea is darling!!!!! Yes…I have some things organized in large jars too…I always want what is at the bottom!! Great idea! I love washi tape. This is such a great way to organize the tape…I always end up buying more because I can’t find the roll I’m looking for. This is such a wonderful idea! I had been wondering what to do with my washi tape collection other than leaving them randomly around. What a great idea! Those rolls are so easy to lose track of! I love washi tape and I love keeping things organized, so obviously I loved your post! 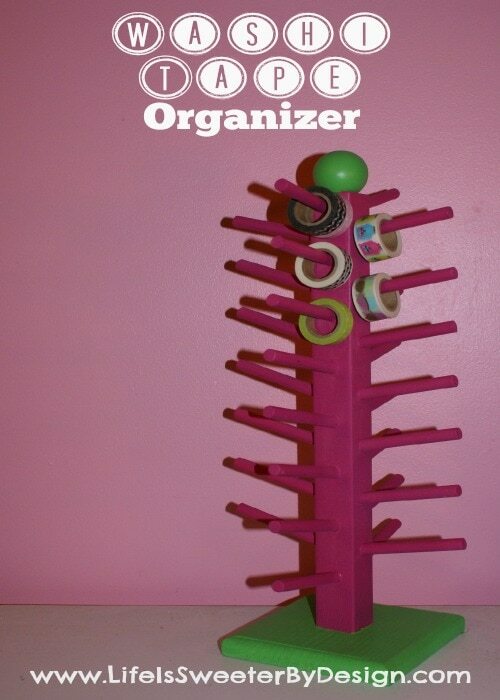 Most of my organization tools come from Ikea, but I love how creative your idea is! I live 4 hours from the nearest Ikea…..probably a good thing though! I would want to buy them out!! I can’t believe I never hard of washi tape. Now I’ll be using my Joanne Coupons. I love it. This is so great! I currently use one I picked up from Michaels, but the quality if pretty awful and I should probably just ditch it for something more functional. Thanks for sharing!